If You Can’t Win a Trade War, Try Winning a Currency War Instead. The article above talks about China’s “nuclear option” in the trade wars. That’s a reference to China’s massive holdings of U.S. Treasury securities and the possibility China could dump them on the market and drive up U.S. interest rates. The so-called nuclear option is a dud as the prior article explains. But, that does not mean China is out of bullets in a financial war. China cannot impose as many tariffs as Trump because they don’t buy as much from us as we buy from them. China cannot dump Treasuries because there are plenty of buyers and the president could stop the dumping by freezing China’s accounts if things got out of hand in the Treasury market. As this article explains, China is considering using a real nuclear option to counteract the trade war by fighting a currency war. If Trump imposes 25% tariffs on Chinese goods, China could simply devalue their currency by 25%. That would make Chinese goods cheaper for U.S. buyers by the same amount as the tariff. The net effect on price would be unchanged and Americans could keep buying Chinese goods at the same price in dollars. The impact of such a massive devaluation would not be limited to the trade war. 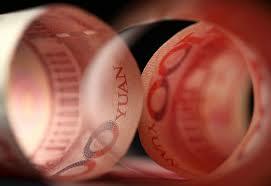 A cheaper yuan exports deflation from China to the U.S. and makes it harder for the Fed to meet its inflation target. Also, the last two times China tried to devalue its currency, August 2015 and December 2015, U.S. stock markets crashed by over 11% in a matter of a few weeks. So, if the trade war escalates as we expect, don’t worry about China dumping Treasuries or imposing tariffs. Watch the currency. That’s where China will strike back. When they do, U.S. stock markets will be the first victims.